Pieter van Rooyen, president and CEO of Edico Genome. A new frontier for the company is health records. Photo by Jamie Scott Lytle. Edico Genome’s processing platform, Dragen, quickens analysis of genomics information, and reduces file sizes. San Diego  San Diego’s Edico Genome recently inked a deal to incorporate genomics data into electronic medical records, a cutting-edge space for which the company appears to be well positioned. Health records stand as a barrier between the wider clinical adoption of genomics, a field that aims to identify a person’s susceptibility to disease, along with individualized treatments. Medical records weren’t necessarily designed to hold large amounts of genomics data. But Edico’s recently announced partnership with medical records giant InterSystems Corp. touts a way forward. The companies say they’ll achieve a “seamless exchange of clinical and genomic information” in health records. That would, for instance, make it easier for physicians to analyze patient data, as well as simplify ordering a genomics test. “We’re simplifying the overall process of integration. And that’s what’s needed to facilitate the take-off of clinical genomics,” said Pieter van Rooyen, president and CEO of Edico Genome. Health records appear to be a natural extension for Edico Genome’s technology. The company doesn’t sequence genomes, but rather specializes in making sense of the data generated. 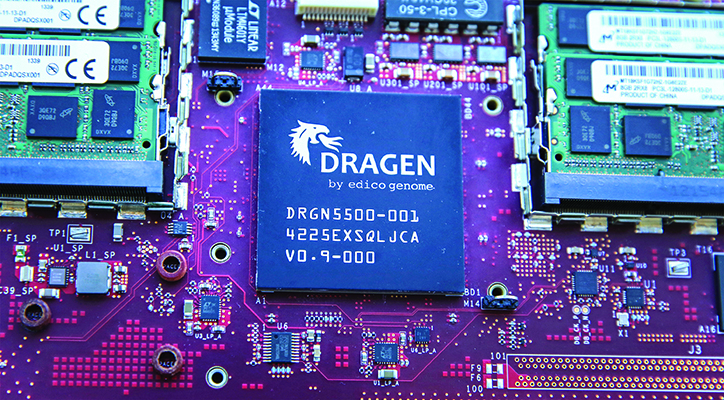 Its processing platform, Dragen, quickens analysis of genomics information, and reduces file sizes. Customers in recent years have included companies, hospitals and universities that previously relied on huge servers to crunch genetic data, at a much slower pace. In addition, Edico Genome has sought to expand genomics in hospitals through partnerships with the likes of Genomics England, owned by the U.K. Department of Health. So, Edico has the technology horsepower — and strong relationships with providers. Cambridge, Massachusetts-based InterSystems brings to the partnership — the financial details of which were not disclosed — a global footprint and a bi-directional platform. The latter, put simply, allows for health data to be shared across providers. Among the challenges facing Edico, Ribitzky said, is that most physicians don’t have the know-how to interpret, manage or deliver genetic test results. He said Edico and InterSystems would be smart to bring genomic counselors into the mix. But the upside is huge. Patients could be treated earlier and thus less expensively, he said. Van Rooyen said this is Edico’s first partnership with a health records company, with potentially more in the works. “We’re positioning ourselves as clinical genomics grow to be able to capture all of that data,” van Rooyen said of health records.